This week’s fund flows from the Investment Company Institute showed an ongoing desire to reduce equity exposure from mutual fund investors. 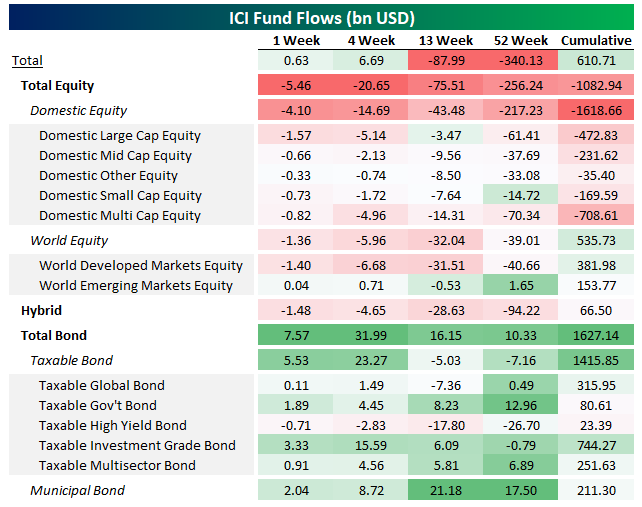 As shown below, domestic, international, and total equity fund categories have seen outflows over the last week, month, quarter, and year. All categories of domestic equity funds have seen net outflows over the past week, month, quarter, and year as well, while EM equities are the only sliver of inflows. It’s the complete opposite for bonds, where inflows have been enormous, including record inflows to mutual funds owning municipal bonds and strong government bond fund inflows. For weekly updates of fund flows, join Bespoke Institutional now with a two-week free trial.